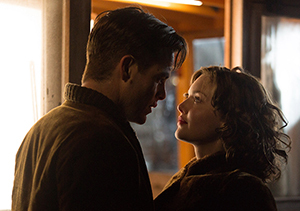 The Finest Hours are lifeless; the movie’s finest moments are the quieter ones. The finest moments are the quieter ones. It’s supposed to be a tale of valor and courage, but perhaps it’s the technical hurdles of recreating stormy seas and a frigid New England winter that ultimately ground this true-life tale. The movie’s opening scenes successfully set the mood of time and place. It’s February 1952, Chatham, Mass. It’s a gentle start as the lead characters are introduced; the color palette suits the time and the mood is nostalgic: for the era’s cars, fashion and human demeanor. Bernie Webber (Chris Pine, Star Trek) is anxious about finally meeting his telephone romance, Miriam (Holliday Grainger, Cinderella). She’s a fast mover. In short order they’re engaged and looking at an April wedding. And… Uh… She asked him to marry her. So Bernie’s a bit of a social runt. A woman asks him for his hand in marriage and there was a Coast Guard incident a while back that has tainted his reputation. It’s smart to have invested the time to get to know Bernie and Miriam, because soon enough Bernie is thrown into an awesome challenge of rescue and survival, with some villagers doubting his ability to succeed. The screenplay by Scott Silver, Paul Tamasy and Eric Johnson, who previously collaborated on another true story, The Fighter, is based on the book The Finest Hours: The True Story of the U.S. Coast Guard’s Most Daring Sea Rescue, by Michael Tougias and Casey Sherman. The story is certainly one worth telling and there’s a sprinkling of interesting characters, including Ray Sybert (Casey Affleck, Ain’t Them Bodies Saints). He’s a classic stoic man of the sea and single man of the city. As a nor’easter stirs the waters off the Massachusetts coast – and winter throttles the villagers in an icy grip – two oil tankers are tossed about at sea. They both split in half and yield an unprecedented challenge for the Coast Guard. With limited resources at hand, one vessel has hope for a rescue, the other is seemingly hopeless. Here, the focus is on the rescue of the SS Pendleton, the one previously deemed hopeless, and it is a crazy situation indeed. Such a massive ship, ripped right into two pieces and the surviving crew members facing a race against the clock as the high seas threaten to entomb the crew in a watery grave. Gripping presentation? Uh. No. The intimate moments, particularly those establishing the relationship between Miriam and Bernie, are engaging. The action, though, is strangely detached. The biggest problem with The Finest Hours is there’s no sense of realism in the staging of the harsh weather. Regardless of whether its Miriam’s car sliding off an icy New England road or the Pendleton out in the choppy, stormy waters, the action is devoid of an emotional resonance. It seems director Craig Gillespie, known for less technically ambitious fare such as Million Dollar Arm and Lars and the Real Girl, isn’t quite up for tackling Mother Nature. For instance, the seas are violently choppy – it’s a nor’easter, after all – and the winds are whipping around viciously and the rain is an incessant pelting of aqua bullets. And yet there stands the crew – outside, on deck and standing as though they’re cruising on Lake Powell. The body motions are too stable and are more indicative of a boat strategically manipulated on a giant gimbal in a massive sound stage rather than a boat in peril. It’s kind of like looking at a Norman Rockwell painting for two hours. The appeal is there, the sense of time and place; but it’s a Rockwell. It’s quaint. For the high seas drama, this material needed more of the darker, layered textures of an Andrew Wyeth or Edward Hopper.